Spring announces itself in so many ways, including the little tendrils sent up and out by so many plants. 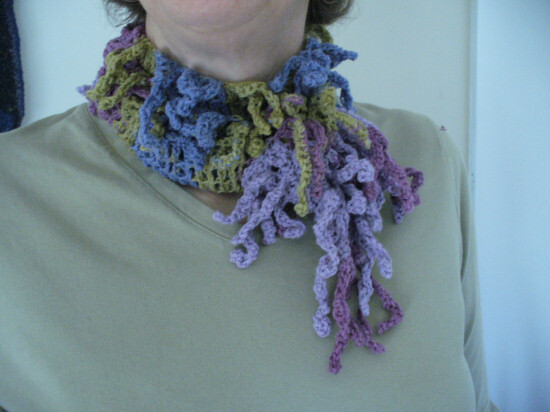 This scarf makes an elegant fashion statement with randomly curling and curving tendrils, and drapes softly over your spring shell or sweater. 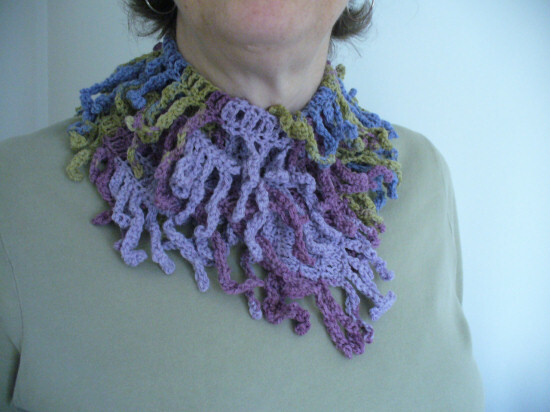 If you’ve ever wanted to try some “free form” crochet, the method used here to create the tendrils will give you a little taste of that experience, while still providing the predictability of a tested pattern. The stretchy mesh of the main scarf provides graceful drape, no matter how the scarf is wrapped or tied. 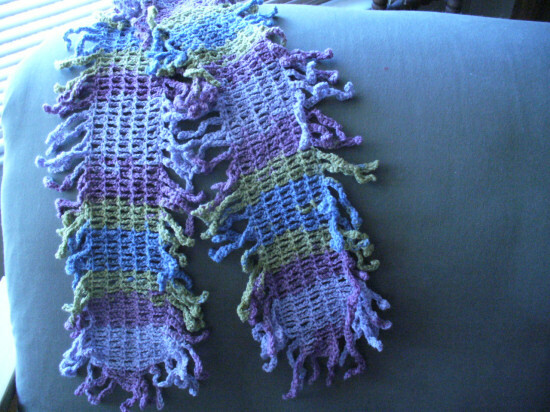 Scarf length can be varied by working more or fewer rows before the decrease rows. The mesh does stretch in both directions, however, so keep that weight and pull in mind if you make it longer… the longer it gets, the more it stretches lengthwise when hung around your neck from the center. When unstretched, the mesh forms a solid, but very soft and flexible, fabric. Instead of using a simple chain for turning at the end of each row, a “tendril” is created. For these to be successful in final appearance, RANDOMNESS is a key factor! To make a tendril, chain any number between 11 and 17, varying the length of the tendrils from row to row. 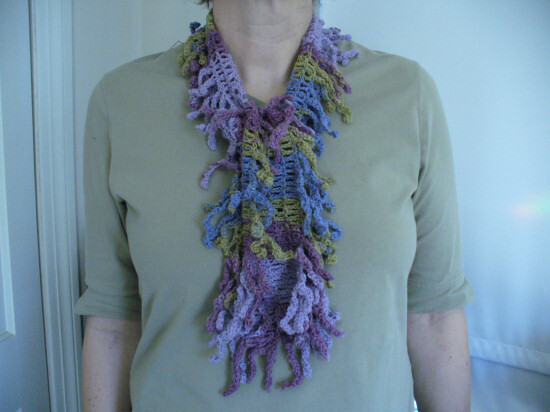 Then work back along the chain, using any combination of single crochet and slip stitches (inserting hook in front loop only, back loop only, back “bump” of chain, or under any 2 of the three strands of a chain). It’s best to work 2 to 4 stitches in one manner and then change for the next 3 or 4. A tendril will twist and bend because of the differences in the stitches, and it’s important to allow this to happen…Like all your worst nightmares about working a twisty chain– here, they’re not only allowed, but encouraged! The final stitch in each tendril should be a slip stitch into the first chain made. Then you’re ready to start the next row of the scarf’s main body. Fsc 21, ch 1, turn. Sc in first ch or st, *ch 3, skip next 3 chs or sts, sc in next ch or st,* repeat from * to * four times, tt. (5 ch-3 spaces, followed by a tt). Rows 4-86 Repeat row 3, varying length and composition of tendrils. Row 91 Sc in first sc, 3 sc in ch 3 space, sc in last sc, tt. Fasten off. Re-attach yarn with a slip stitch in opposite side of first / foundation row from first half. Repeat rows 2 through 90 of first half. 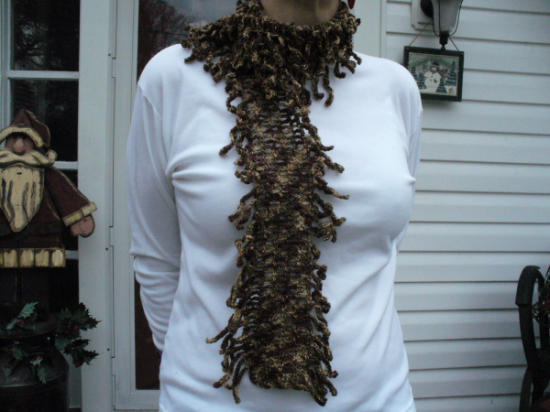 Editors Note: The scarf can be worn in a variety of ways and looks different each time. Extremely versatile!